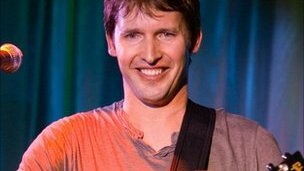 Singer James Blunt has told the BBC how he refused an order to attack Russian troops when he was a British soldier in Kosovo. Blunt said he was willing to risk a court martial by rejecting the order from a US General. But he was backed by British General Sir Mike Jackson, who told him "I'm not going to have my soldiers be responsible for starting World War 3". Blunt was ordered to seize an airfield - but the Russians had got there first. In an interview with BBC Radio 5Live, to be broadcast later on Sunday, he said: "I was given the direct command to overpower the 200 or so Russians who were there. "I was the lead officer with my troop of men behind us ... The soldiers directly behind me were from the Parachute Regiment, so they're obviously game for the fight. "The direct command [that] came in from General Wesley Clark was to overpower them. Various words were used that seemed unusual to us. Words such as 'destroy' came down the radio." "We had two hundred Russians lined up pointing their weapons at us aggressively, which was... and you know we'd been told to reach the airfield and take a hold of it. Asked if following the order would have risked starting World War 3, Blunt, who was a 25-year-old cavalry officer at the time, replied: "Absolutely. And that's why we were querying our instruction from an American general". "Fortunately, up on the radio came General Mike Jackson, whose exact words at the time were, 'I'm not going to have my soldiers be responsible for starting World War 3', and told us why don't we sugar off down the road, you know, encircle the airfield instead. "And after a couple of days the Russians there said 'hang on we have no food and no water. Can we share the airfield with you?'."